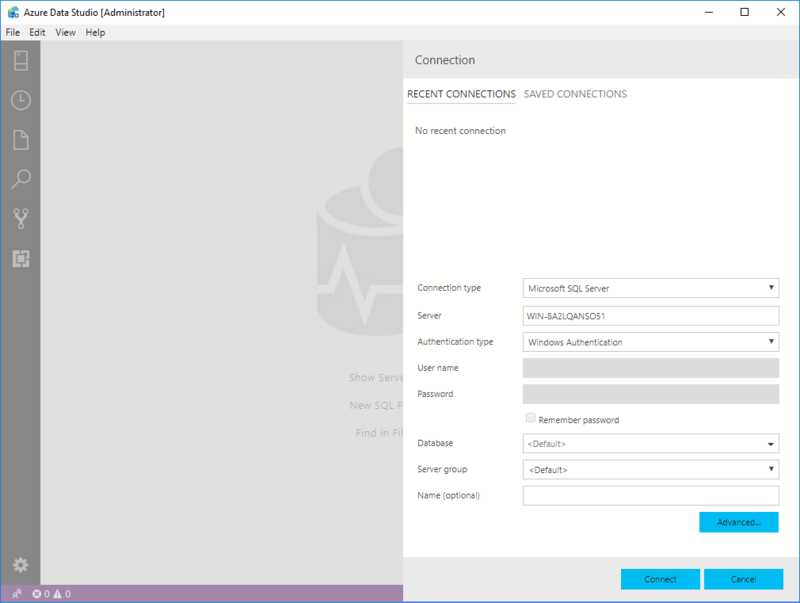 Let's take a look at an introduction to Azure Data Studio as well as explore the SQL Server connections that it has. 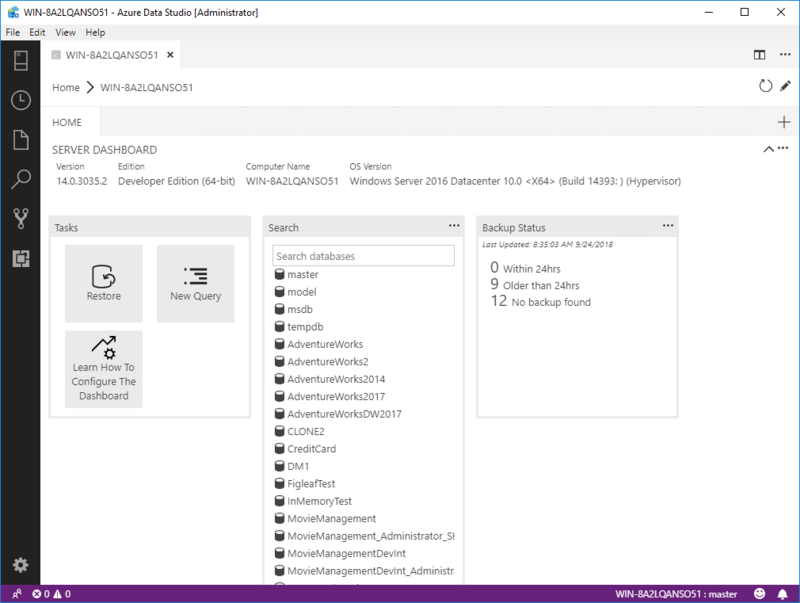 If you're watching Microsoft Ignite or tracking the information coming out of it on social media, then you know that Azure SQL Studio has been changed to Azure Data Studio. I've got an early release on some of the bits. Let's explore what's going on. The core concept here is to have a development tool that gives you a common framework for working with data, not just SQL data, but CosmosDB and others. Further, a tool that you can run where you work. Do you have a Mac? Cool. Use Azure Data Studio. Running Linux? Cool. Use Azure Data Studio. Still on Windows with me? We also get Azure Data Studio. Immediately, I'm excited. Why? Backup info is front and center. I get that this is meant as a development platform, but how wonderful that they're letting us know the current status on backups, even in a development tool. You see that on the right. On the left, they have some tasks set up. Across the top is info about the server you're connected to. In the middle are the databases. Double-clicking a database shows the objects in the database, in that same kind of listing. There's no hierarchy of objects, so tables, views, etc., are just mixed together. You can search for an object quickly. Also, you can customize these charts, adding your own, putting in monitoring and whatnot. It's handy. I also opened up the query window, after all, this is about development. It is not your grandpappies query editor. This thing is pretty slick. There are all sorts of functionality above and beyond what is offered in SSMS. This is a development tool. As such, source control is built in as a fundamental part of the tool. I haven't hooked that up just yet, but I'll write another post once I've got it done. I'd like to point out two that I think are really interesting. First, Redgate SQL Search. That's right, we're already available in Azure Data Studio. The second one I want to point out is right at the bottom, SQL Server Profiler. It does resemble Profiler, but don't worry. I'm very impressed — and quite happy — that this functionality is coming with the tool right out of the gate. If the sacrifice we have to make is calling Extended Events, Profiler, so be it. There is so much more to Azure Data Studio that I could be showing you. However, I just wanted to give you an immediate taste. 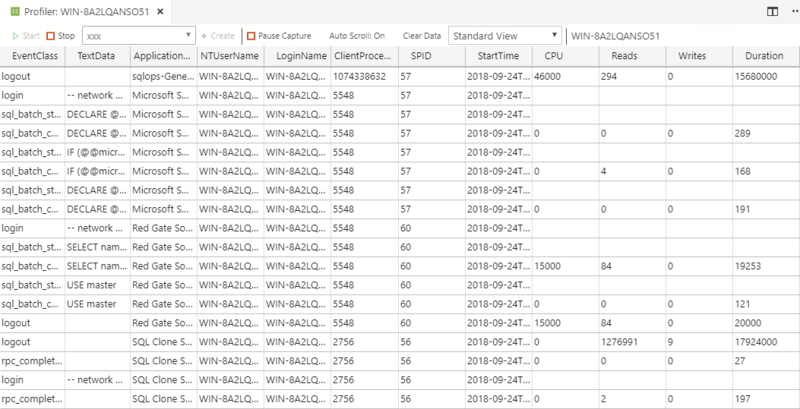 If you're a data developer in the Azure stack, and not just on SQL Server, you really need to get a hold of Azure Data Studio and start to work it into what you do. You're going to be pleased. Just don't look at the execution plans yet. How Do You Export a Database in Azure Data Studio?